Blue Dreamers is a small study of one of my favorite flowers. The buds are on the pear tree and the iris leaves are greening up in our garden. Of all the flowers that grow in the back yard, I always get the biggest kick out of the hydrangeas. I found two little grocery store plants and put them into the ground a few years ago and it is nothing short of a miracle that they can survive the Texas summer heat. 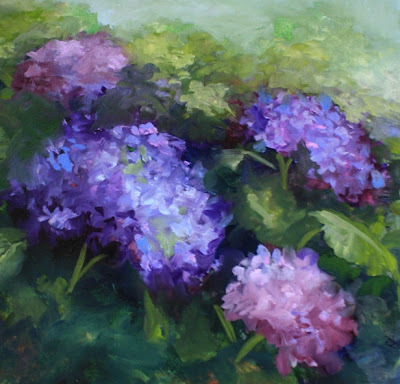 Hi Nancy, I loved painting hydrangeas during my watercolor decade. (An advantage of ageing is dividing your art into periods).I found that these flowers could withstand the heat of Cape Town. Lovely painting, I find it amazing that you are still producing so close to your show!My nerves would never allow that! Very beautiful, Nancy! I love the perspective you created. Thank you Becky, I like the darker shadows, too, those were inspired from the Arboretum gardens and there are lots of great shady spots there. Ed, thanks very much. These were based on a large garden of hydrangeas at the Dallas Arboretum, hundreds of them went on into the distance. I appreciate the kind words! oh you make this look so easy! i love how your paintings just flow right out you like love!